Guava is the fruit which is nutritious and contains Vitamin C, niacin, iron, potassium, manganese, Vitamin A, thiamine, calcium and phosphorus. It has the taste of combination of strawberry and pear. It has high water content and fiber. It has carminative, antispasmodic, sedative, anti-cancer, digestive, antihyperglycemic, antibiotic and anti-inflammatory properties. It helps to reduce the risk of diabetes, get rid of digestive disorders such as diarrhea, acidity, constipation and stomach ache, promotes fertility. It helps in losing weight. Consuming this fruit in daily basis is great for the skin too. The guava has many small seeds with maroon or white pulp. The guava seeds are edible. The guava is loaded with antioxidants, essential fatty acids, iodine and other nutrients. The skin and seed of the guava possess carotenoids, flavonoid, glycosides and phenolic compounds. It has also got antibiotic and anti-inflammatory effects. It is highly recommend that guava seeds must consume with whole guava (including skin and flesh). Only seeds could cause problem in stomach. The guava seeds and fruits help to lower the high blood pressure as it is rich in potassium and antioxidants. As banana is known to be high in potassium, guava contains 60% more potassium than the banana which is medium sized. The studies have noted that the adequate consumption of potassium helps to regulate the blood pressure. The guava seed helps to prevent the risk of cardiovascular diseases with its antioxidant properties and bioactive compounds by controlling the glycemia, triglyceride level and body weight. 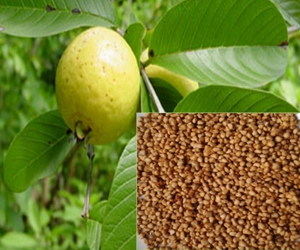 Guava seeds are effective in curing constipation with its stimulant laxative effect. It helps in digestion because guava seeds are a great source of dietary fiber. The guava if consumed with seeds helps to get rid of constipation by improving bowel movements. To prevent acidity, the seeds should not be chewed. It should be swallowed after chewing the pulp. The guava pulp and seeds helps to eliminate the growth of cancer cells. It possesses lycopene in the high amount which helps to confront the prostate cancer. It also helps to prevent the development of breast cancer cells. The cancer is controlled and prevented by the antioxidant which helps to defend the body from free radicals. Guava seed extracts provide the anti-cancer effects on hematological and solid neoplasms. As the guava seeds possess the polyunsaturated fatty acids helps to maintain the cholesterol levels. 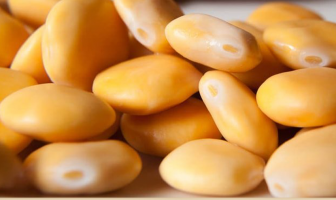 As the seeds are loaded with fiber, it helps to prevent the bile absorption in the intestines. The liver produce bile salts to cover the loss of bile. The cholesterol in the bloodstream is lowered as the body produces the bile salts by increasing the production of LDL receptors. Furthermore, it’s not feasible for guava seeds to get stuck within the kidneys since the kidney just isn’t attached to stomach or even any section of the digestive system. However, there exists a probability that the seeds could get stuck within the Appendix. To be a lot more particular, it’s called “diverticulitis”. This is the situation where guava seeds may cause inflammation of the diverticulum within the intestines. It is therefore best not to consume more quantity of guava seeds at the same time.